Samsung claims another world's first with its Android Wear smartwatch debut, tied as usual with LG. On the outside, Gear Live is almost exactly like its previous watches, but the Google software on the inside makes worth the time of early adopters. Update: Our Samsung Gear Live review now cites new smartwatch competition and we revised Page 5 with newly discovered Android Wear apps. Face it, your smartphone is getting bigger whether you like it or not, and Samsung's popular, but ridiculously sized, phablets are chief among the super-sized phones. For this very reason, the Samsung Gear Live feels increasingly relevant. Its Google-powered Android Wear software safely relocates our notification-checking addiction to the wrist. There's no need to fumble around with that 5.7-inch Samsung Galaxy Note 3 screen to see why the device just vibrated. The smartwatch has the answer too. A simple flick of the wrist solves the notification mystery and keeps your easily breakable and losable smartphone in your pocket more often. Put that giant smartphone back in your pocket! It should be noted that this isn't a smartphone-eliminating device. There's no SIM card and you can't make calls directly from the watch, surf the web or kill time on YouTube. Some of these functions are coming to the newly announced Samsung Gear S, a standalone curved smartwatch. Like the rival LG G Watch, Samsung Gear Live still requires toting around an Android phone running Android 4.3, Android 4.4 or, if you're adventurously testing the beta, Android L.
It's a $200 (£170, AU$250) digital convenience for quick glances at texts, emails, Facebook notifications and other apps with the occasional ability to respond with voice commands. 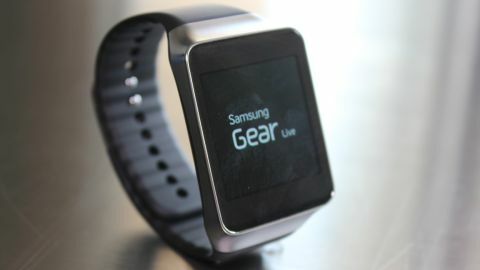 Samsung has been down this same road before with non-Android Wear watches like the maligned Galaxy Gear and its better, square-shaped follow-ups, the Gear 2 and Gear 2 Neo. But it's Google's work-in-progress software that makes the Gear Live a little more relevant, a little more compatible and a little better priced than Samsung's Tizen-running smartwatches. Samsung Gear Live ushers in the predictive powers of Google Now in smartwatch form, along with the LG G Watch, but the hardware design is easily the most predictable aspect of it all. The square watch face has a 1.63-inch Super AMOLED display and a 320 x 320 resolution that provides a remarkably vivid 278 pixels-per-inch picture. It's always-on screen illuminates with the rotation of your wrist or a tap of the touchscreen and it looks best at the highest brightness. Of course, that does compromise battery life considerably. However, not having the screen at the maximum brightness makes it difficult to read when outdoors in direct sunlight, especially when wearing sunglasses. If all of this sounds familiar, that's because these are the same display specs as the Gear 2, Gear 2 Neo and Galaxy Gear. Samsung hasn't rocked the boat at all in ten months time. There's actually little reason for it to update the specs. Look at the Pebble Steel. It sports a monochrome e-paper screen that is dated and doesn't feature a necessary touchscreen. The LG G Watch, meanwhile, has an inferior 1.65-inch LCD IPS display that's 280 x 280 with 240 pixels per inch. The difference is noticeable in a side-by-side comparison. Gear Live gets away with last generation watch display specs, at least until the September-bound Moto 360 with its circular watch face and wireless charging emerges as the potential flagship Android Wear smartwatch. Fall's LG G Watch R isn't far behind either.